If you want to know what body composition is, how to measure it easily and accurately, and how to actually improve it, then you want to read this article. Now, what if I told you that per the standard medical assessment of body fatness — the body mass index (BMI) — I’m overweight? And that I’d need to lose at least 10 pounds just to be in the “normal” range? Something is obviously wrong here. Well, it’s pretty simple: while BMI can be helpful for examining large groups or populations of people, it’s not a great way to analyze individuals. And especially not individuals like me, who have quite a bit more muscle than the average person. In other words, if you want a snapshot of the overall fitness of a million people, you can calculate their average BMI and get an idea of what you’re dealing with. If you want to drill down into individual people, though, you have to look at something else: body composition. And in this article, you’re going to learn how to do just that. By the end, you’re going to know what body composition is, how to measure it accurately, and last but not least, how to improve it. What's the Most Accurate Way to Measure Body Fat, Then!? Weigh yourself daily and calculate an average every 7 to 10 days. How Do You Improve Body Composition? What’s your take on body composition? Have anything else to share? Let me know in the comments below! Many people mix up body composition with body fat percentage or BMI, but it’s neither of these things. Let’s look at BMI first. Your BMI is calculated by dividing your weight in kilograms by your height in meters squared. Next, there’s body fat percentage, which is simply the percentage of your weight that’s fat. I mentioned earlier that I weigh about 195 pounds and am at about 8% body fat, which means I’m carrying something around 16 pounds of fat. This brings us closer to body composition, which involves determining not just our total levels of fat, but of muscle, water, and bone as well. Fat mass, which is all of the fat in your body. Fat-free mass (often referred to as FFM), which is everything in your body that isn’t fat, including muscle, bone, blood, organs, water, glycogen, and more. By monitoring these things — as opposed to BMI or just body weight — we can better understand our fitness level and the changes that occur in our bodies when we diet and exercise. For example, let’s say you follow a sensible diet and training program and your weight goes down but your fat-free mass stays the same. Well, that’s exactly what we want because it means that you’ve lost fat and not muscle. If, however, you starve yourself, eat too little protein, and do an unconscionable amount of cardio, you’re going to lose weight alright…but it’s going to include quite a bit of muscle as well. The body composition model is equally relevant to gaining weight as well, because the goal isn’t to merely gain weight but to gain muscle and not fat. While it’s generally true that you have to accept some fat gain to maximize muscle growth (unless you’re new to weightlifting, in which case you can gain muscle and lose fat at the same time), you shouldn’t be gaining fat much quicker than muscle. Theoretically, calculating your body composition is simple. All you have to do is measure your body fat percentage because once you know that, you can work out your total fat mass and, in turn, your fat-free mass. Body composition scales and handheld devices are the simplest way to measure body fat percentage. They’re also extremely and unreliable and inaccurate. The reason for this lies in the method they use to analyze your body composition: bioelectrical impedance analysis (BIA). BIA involves passing a light electrical current through your body and measuring resistance to it. Muscle (being over 70% water) conducts electricity well, but fat (which contains a lot less water) doesn’t, which is why the leaner you are, the more conductive your body is. That being so, you should be able to correlate levels of electrical resistance with levels of body fatness. The method is inherently handicapped. Electricity will take the path of least resistance through your body, which means it will bypass fat for more conductive tissues. For instance, if someone has a huge amount of subcutaneous fat, the current will avoid it and pass through internal tissue instead. Moreover, many two-electrode devices (like scales and handheld devices) miss entire portions of your body. Foot-to-foot devices can circumvent the entire torso, while handhelds can pass over the upper half. Obviously, this makes for some very inaccurate data and results. Another one of the BIA’s methodological problems is that the body fat readings are equation-based predictions, which can be totally off. That is, the devices are using electrical currents to obtain raw data and then using math to turn it into a body fat percentage. The BIA device’s development team first measures the body fat percentage of a large group of people using a “gold standard” method of analysis. The team then tests the same group of people with their BIA device, compares the measurements, and comes up with an equation to predict results based on variables such as height, weight, and gender. It sounds reasonable enough, and if it went off without a hitch, it would work pretty well. But can you guess where it falls apart in actual practice? That’s right — the original benchmark method is often wildly inaccurate. For example, hydrostatic weighing commonly used for obtaining guideline measurements, and research shows that it can be off by as much as 6 percentage points due to various factors including ethnicity, body weight, and hydration status. When you calibrate inherently flawed BIA instruments with faulty yardstick measurements, the whole methodology becomes more or less useless. Testing conditions can greatly influence readings. If you’re dehydrated when you BIA test yourself, it will increase electrical resistance in your body, which will cause your body fat percentage to register higher than it is. If you BIA test after eating a large meal, electrical resistance will be lower than usual and thus you’ll register leaner than you actually are. In one study, this accounted for error rates as high as 4 percentage points. Exercise is another factor that can seriously skew BIA measurements because it improves conductivity in the body. This, in turn, leads to an overestimation of fat-free mass and underestimation of fat mass. In one study, this resulted in a fat-free mass reading that was a staggering 25 pounds too high. In the final analysis, BIA readings are just too all over the place to be useful, even if you attempt to control factors such as hydration, food, and exercise. Skinfold testing involves using calipers to measure the thickness of your skin at certain points on your body. These measurements are then added together and plugged into equations that are supposed to extrapolate how much of your body is fat-free mass and fat mass. Unsurprisingly, there are a number of ways for this to go awry. First, there’s user error — grab too little skin and fat and you’ll get a falsely low reading; grab too much and you’ll end up with a number that’s too high. Then there are the equations used to convert skin thickness readings into a body fat percentage — research shows they can spit out some wonky results. This explains the error rates for skinfold testing that we see in various clinical studies. For example, in one study, it underreported body fat percentage by an average of 6 percentage points. Individual discrepancies were even worse, ranging from 10 points too high to 15 points too low. In another study, skinfold testing produced body fat readings that were up to 5 percentage points low and 3 points high. Similar error rates were seen in this study conducted with bodybuilders. So, the bottom line with skinfold testing is too can’t deliver consistently accurate body fat measurements. That said, it can be quite useful for monitoring changes in your body composition, which is something we’ll talk more about in a minute. 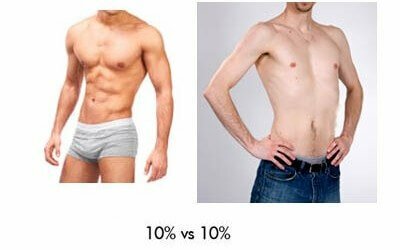 The visual appearance of various body fat percentages can vary quite a bit depending on how much muscle people have. For example, an average looking guy at 160 pounds and 10% body fat has about 16 pounds of fat. A muscular guy at 190 pounds and 10% body fat has only 3 pounds more fat but a whopping 27 pounds more fat-free mass. Both are around 10% body fat but the one on the left has quite a bit more muscle, giving him a dramatically different look. The coveted six pack starts to show at around 10% body fat in men, and 18% in women. Ab and core vascularity starts to appear at around 8% in men, and 15% in women. The skin takes on that paper-thin, “grainy” look at about 6% body fat in men and 13% in women, and becomes more pronounced as you get leaner. Pictures and the mirror are a simple way to guesstimate body fat percentage and monitor body composition. DEXA involves a full-body x-ray to determine total fat and fat-free mass. This is possible because bone and different body tissues absorb x-ray energy differently. You’ve probably heard that DEXA is a foolproof method of measuring your body fat percentage, but it’s not. Results can vary between machines, even if they’re produced from the same manufacturer. Algorithms used to convert raw data into body composition measurements differ and thus outputs can differ. The type of x-ray used influences the results. Like BIA, hydration status can significantly impact DEXA results (even minor changes in the hydration levels of lean mass can be enough to skew results). Results are affected by gender, body size, total fat mass, and even disease state. Thus, we shouldn’t be surprised to see error rates not unlike any other method discussed in this article. For example, two studies found that individual error rates using DEXA went as high as 4 percentage points. In another study, individual error rates in the range of 8 to 10 points were seen. In yet another, DEXA significantly over-estimated decreases in body fat and underestimated increases. Despite its high reputation among fitness panjandrums, DEXA isn’t a consistently accurate method of assessing body composition. The Bod Pod is a machine that works similarly to hydrostatic weighing. It measures the amount of air your body displaces inside a sealed chamber and uses equations to translate this into an analysis of body composition. Well, you now know about the failings of hydrostatic weighing and, unfortunately, the Bod Pod looks to be even worse. For example, in one study, individual error rates were up to 15 percentage points, and in other studies, they’ve ranged from 5 to 6 points. The crux of the issue with the Bod Pod is its results are affected by all kinds of things like facial hair, moisture, body temperature, and even the tightness of clothing worn inside the chamber. Like everything else discussed so far, the Bod Pod is just too inaccurate in measuring body composition to be relied upon. What’s the Most Accurate Way to Measure Body Fat, Then!? There’s one way to measure your body composition with 100% accuracy, and trust me — you’re not going to be up for it. If you removed all of your fat, muscle, bones, and organs, and weighed them, you’d know your body composition with absolute certainty. And then you’d have to somehow put Humpty Dumpty back together again. My point is everything else is just an estimation of body composition — not an exact assessment — and while some methods are better than others, none are out and away winners. What method do scientists use to determine the relative accuracy and inaccuracy of all these methods? That is, what’s the method against which BIA, DEXA, Bod Pod, hydrostatic weighing, and skinfold is compared against? For example, hydrostatic weighing can be used to accurately measure body density, total body water can be precisely quantified through deuterium dilution, and DEXA scans can faithfully report total bone mass. This multi-step type of analysis provides a highly accurate picture of your body composition, but — sad face — requires access to a team of well-equipped scientists. Your weight fluctuates every day due to things like water retention, glycogen storage, and bowel movements (or the lack thereof). That’s why flogging yourself over small unwanted increases or decreases in weight is silly and counterproductive. Instead, work with weekly averages, which will show you what’s really happening with your weight. First thing in the morning each day, after using the bathroom and before eating or drinking, write down your naked weight. Then, after 7 to 10 days, add your weights up and divide the sum by the number of days. That’s your average for that period. Watch those averages over time and you’ll be able to see if things are actually moving in the right direction or not. 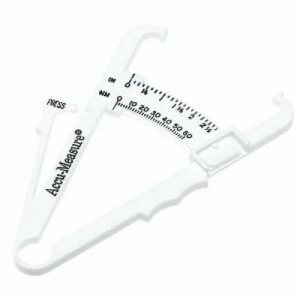 Extrapolating body fat percentage from caliper measurements is hit and miss, but the measurements themselves are quite useful. If your skin is getting thicker over time, you’re gaining fat. If it’s getting thinner, you’re losing fat. I like one because it’s a one-site testing method, meaning that you can take measurements yourself, and it’s surprisingly accurate for its simplicity. The size of your waist (measured at the belly button) is a reliable indicator of fatness. If your waist is shrinking over time, you’re losing fat. If it’s growing, you’re gaining fat. And that’s why I recommend that you note down your waist measurement weekly. There’s nothing fancy that you need for this – a simple measuring tape will do. What you see in the mirror is, ultimately, what matters most. If you’re gaining muscle and losing fat, you’re going to look better and better, regardless of what the scale or anything else says. So, take weekly front, back, and side pictures in good, consistent lighting and, over time, your progress (or lack thereof) will be easy to see. In the end, it’s more or less impossible to know for certain what our exact body fat percentage is. We’re going to have to settle for an educated guess. That said, we can track changes in our body composition fairly accurately, and that’s what matters the most. That’s it — those two goals encompass everything we want to achieve with our bodies (and that applies to both men and women). In the end, all you need to do to get the body you want is build a certain amount of muscle and maintain a certain level of body fat. How much muscle you need to gain and how low your body fat will need to be will depend on how you want to look. Aspiring bodybuilders will need to gain anywhere from 45 to 60 pounds of muscle and be able to reduce their body fat to very low (unhealthy) levels. The rest of us, though, don’t need to go to such extremes. The look most guys want requires gaining about 25 pounds of muscle and being around 8 to 10% body fat. The look most girls want requires gaining 10 to 15 pounds of muscle and being around 18 to 20% body fat. And anyone, regardless of genetics, “body type,” or anything else, can do that. Read: What Are Healthy and Unhealthy Body Fat Percentages? If you want a diet and training program to get you there, check out my bestselling books — they lay out everything. Most people are far too obsessed with weight — losing weight, gaining weight, maintaining weight, and so forth. This misses the forest for the trees because, for example, you can lose weight without losing much fat (losing muscle) and gain weight without gaining much muscle (“dirty bulking”). Mission accomplished — you’ve lost or gained weight — but battle lost, you look worse. This is why it’s much better to think in terms of body composition. If you can do those two simple things, you can get the body of your dreams. I hope this article helps.